Inspired by Bespaq's lovely Lorraine set. 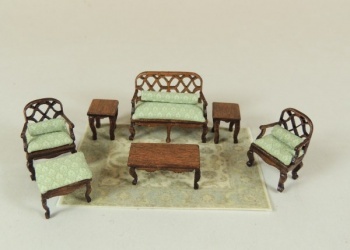 Elegant 7 piece parlour set. Includes settee, two arm chairs, ottoman, coffee table, and two end tables. Graceful bentwood styling, and cabriole legs add to this set's delicate charm. Available in wedgewood blue or soft green upholstery.